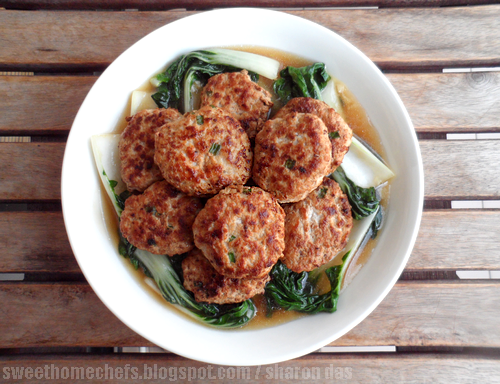 What do you think of pear pork patties served on a bed of vegetables? A healthy balance? Juicy? I found it quite a palate pleaser and look forward to making it again! These, made larger, would make a great patty for a burger too. 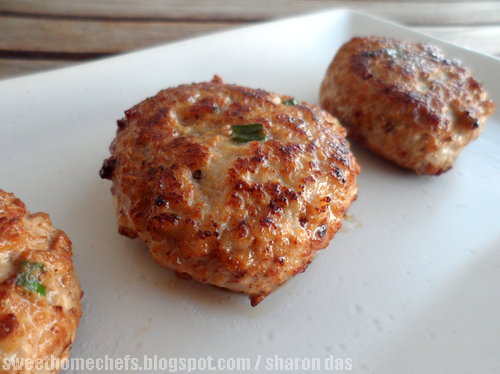 The meat patty is similar to the ones I made sometime back, which I paired with buns - Read: Pork Apple Burgers. How I chose to present this is an inspiration from Nigel Slater's pork meatballs with anchovies recipe. I must tell you that these are really easy to do, a simple case of meat mixed with seasoning, shaped into flat patties and fried. The pear gave the minced meat a nice flavour. It is further complimented with the strong sweetish taste from rice wine that comes from the vegetable sauce. Combined together in a dish, it all ties in deliciously. If you're keen to try, here's how I did it. 1) Combine chilled minced pork, pear, spring onion and seasoning (salt, black pepper, chili flakes) together in a bowl. 2) Roll into 10 small balls. Lightly flatten it. 4) Place on a paper towel to drain excess oil. Leave aside. Note: It's easier to work with when the meat is chilled. 1) Heat a little oil in the pan. Saute the garlic. 2) Add vegetables, water and oyster sauce. Stir to combine. Then, cook covered until vegetables are almost done. This should take only a little while. 3) Then, add rice wine. Switch the fire off. Stir in the tapioca flour to thicken the sauce. Plate cooked vegetables. Place meat patties on top. Best eaten with rice. 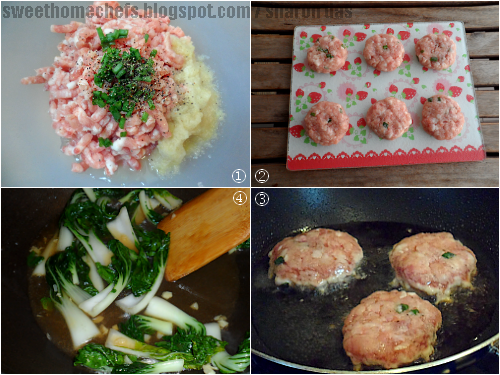 Pear Pork Patties That Didn't Go Into A Burger! Dying to have this, Sharon! I haven't had a combo of pears with minced pork. Love the idea and I'll surely be trying this out in the future. We don't have nai pak but a substitute should work well. 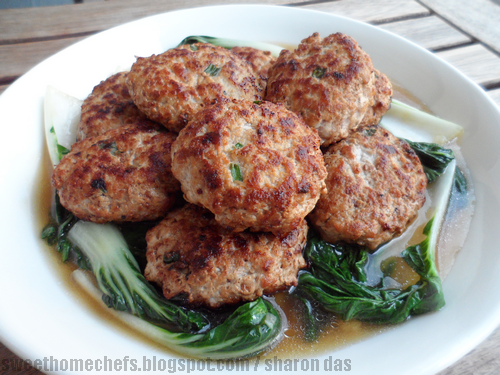 My husband loves meat patties..and this is a brilliant recipe mixed with pear, Sharon. 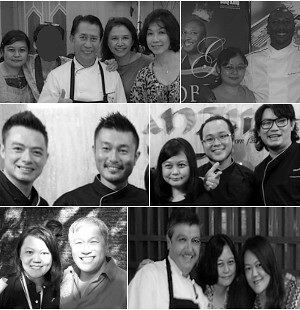 Gosh, you're cooking a lot these days! I usually use chestnuts, but pear is something new. Yummy! Next time you make them for me, Sharon!